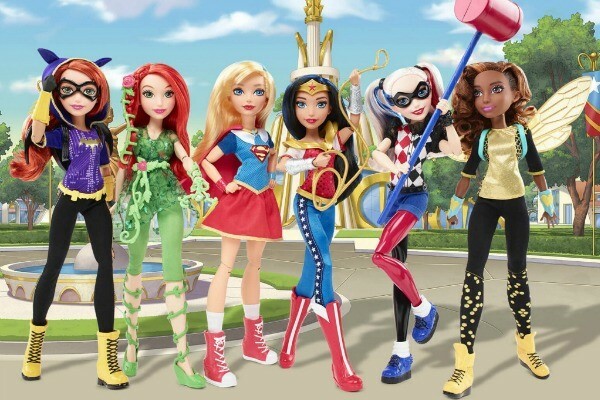 DC SuperHero Girls are one of the newest lines of dolls designed by Mattel that are finally pushing gender stereotypes aside and making room in the Barbie Dream House for women of all shapes, sizes, and superpowers. Turns out, the reason behind the success of the dolls comes from some very clever market research and assistance from women bloggers and academics. Mattel toy designer Christine Kim and Mattel Chief Operating Officer Richard Dickson say the dolls have been a long time in the making. It took a lot of market research to ensure the dolls, which include Poison Ivy, Wonder Woman, Supergirl and Batwoman will appeal to fans of all genders. After the initial research, the team went back to the drawing board with instructions to use gymnasts, dancers and basketball players as primers for sculpturing a more muscular version of the dolls. Another obvious decision what for the team stuck to the true superhero colours rather than shifting towards the “female” gender stereotype. For example, Supergirl’s cape is red, not pink. In fact, there is no pink in sight. You will also notice that the girls have flat shoes rather than the traditional heels, must better for fighting crime and saving the world. There’s no word yet on when these super dolls will be available in Australia, but we’ll certainly let you know. What do you think, Babyologists? Does this doll help smash gender stereotypes? Will you be adding a DC SuperHero Girl to your child’s Christmas list this year?